When we visited New York last year, Joshua ate a bagel for breakfast every single day. If memory serves correctly, that's 10 bagels in a row. Always toasted with cream cheese. I prefer a little more variety and switched things up with croissants or yoghurt, but was rather fond of the strawberry cream cheese bagel. We visited a pop up market on Saturday where the usually Darlinghurst based 'Brooklyn Boy Bagels' was making an appearance. There was a 20 minute power outtage, which made toasting the bagels kind of tricky, but once they sorted things out we were good to go! Delicious bagels with a schmear that taste just like ol' New York. 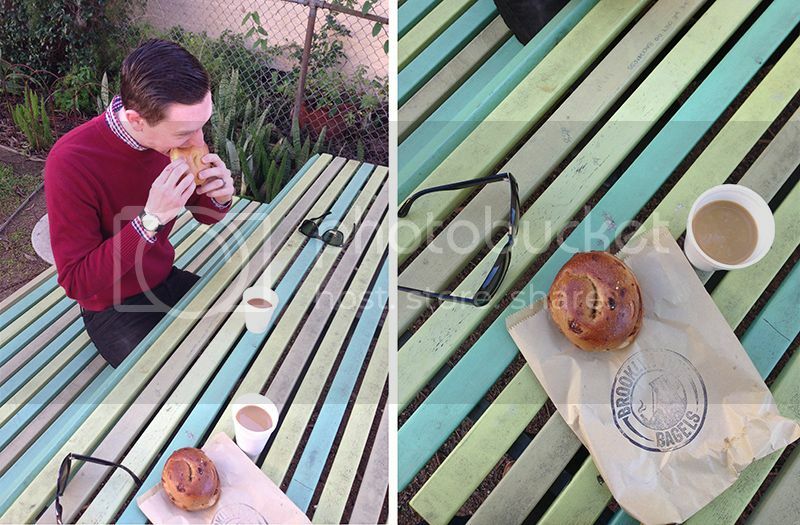 I went for a cinnamon raisin bagel with Italian Nutella, Josh stuck to the cream cheese, and we sat in a little park in the warm winter sunshine with filtered coffee that also tasted just like America. Although I'll never really get on board for the filtered Americano coffee, it was a very pleasant way to spend a Saturday morning.